There is simply no stopping "Zipping, Zooming Zoe," who just happens to be the "Greatest Gymnast of All." She's up, then down, on the mat, then off, over the hoop, then under. Recognizing opposites helps children develop the spatial sense necessary for the development of geometry concepts. 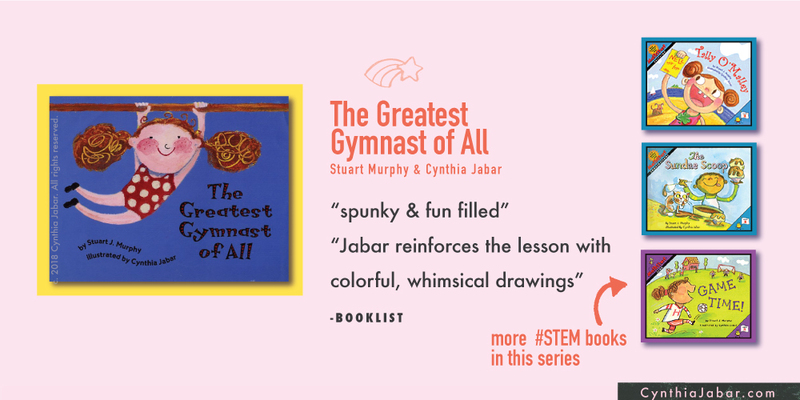 This title in the MathStart series presents spunky, redheaded Zoe performing in a gymnastics competition. As she executes each of the movements in her routine, the rhyming text describes a variety of opposites. These concepts of opposites are visually captured in the energetic illustrations. Rich and brightly colored, whimsical illustrations portray Zoe's high-spirited enthusiasm asshe jumps inside and outside, flips high and low, swings on and off, and cartwheels backward and forward. Adults and children will enjoy engaging in the various activities, which are listed at the end of this work. This concept book is a fun-filled way to introduce young children to the important world of opposites. —April Judge, Used with the permission of Copyright. All rights reserved. Can a Cooperative Game Cultivate Empathy? Want to Make & Doodle A #NewStory? I respect your privacy. No spam-spams. All content c. Cynthia Jabar 2018. All rights reserved. Thank you!